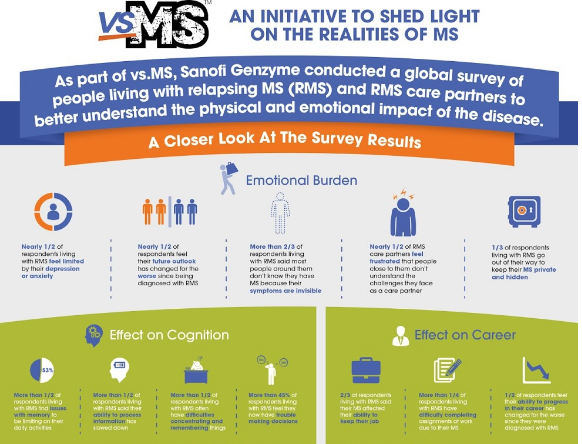 Sanofi Genzyme recently launched vs.MS, a global initiative to raise awareness of the often unspoken physical and emotional burden of relapsing multiple sclerosis (RMS) on people living with the disease and their care partners. On World MS Day yesterday, the company called on the MS community to learn more about the disease and to declare themselves vs.MS on the website, www.vs-MS.com. Sanofi Genzyme will make a donation to the Multiple Sclerosis International Federation (MSIF) for each vs.MS statement. To better understand the full burden associated with RMS, Genzyme conducted a global survey in 1,500 patients with RMS and their care partners across the United States, Canada, the United Kingdom, France, Italy, Spain and Australia. Results from the survey revealed the physical and emotional toll that RMS patients face on a day-to-day basis. The vs.MS survey results also showed the effect of the disease on the emotional well-being of those living with the RMS and their caregivers. For example, more than half of the patient respondents felt isolated or lonely because of their disease, while more than half of care partners do not discuss their fear of the disease advancing to avoid disturbing the person they care for. More than half of the respondents feel that their ability to progress in their career has changed for the worse since they were diagnosed with RMS, that their ability to process information has slowed down, and that memory issues limit their daily activities. Nearly half of the respondents feel limited by depression or anxiety, and more than one-third feel that urinary problems-related with the disease affect their decisions when planning to leave the house. The campaign website includes educational modules, survey results and videos.